Sadly, one of the Middle Island loons was recently found dead on the lake. 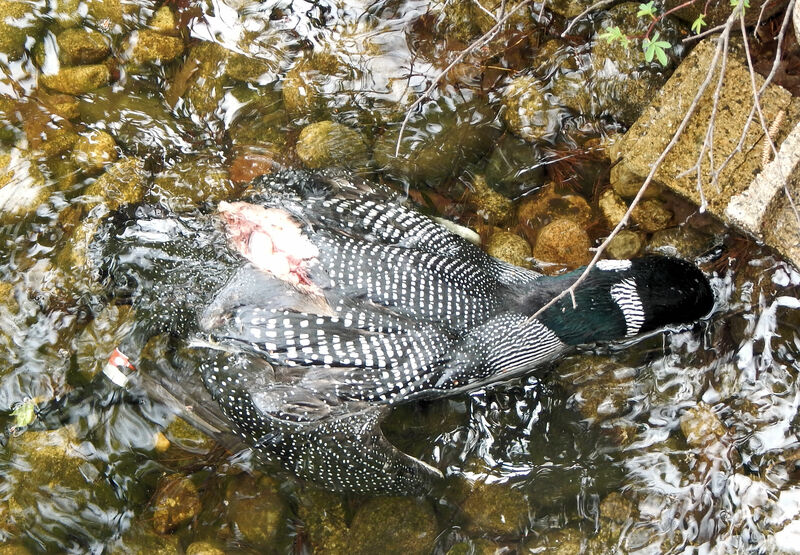 The loon was found on Sunday May 20th at about 11:00 am in the vicinity of 121 Hi Vu Drive. Based on its injuries it was likely struck by a propeller on or around May 20th . The Maine Warden service was contacted and they picked up the loon, which was a male. The loon had earlier been tagged by the Biodiversity Research Institute, which has been informed as well. This serves are reminder to all power boat and jet ski users to be on the lookout for loons. Loons dive deep and for minutes at time in search for food. They can pop up anywhere at any time. PLEASE keep an eye out for them and respect their space when boating. 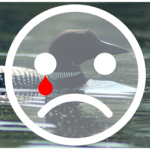 While tragic, trauma is not the main risk factor for loons – it’s ingesting lead fishing tackle, which causes 44% of all loon deaths. GET THE LEAD OUT! Lead tackle is now illegal in Maine. 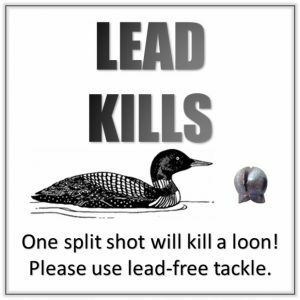 Learn about and use lead free tackle – it’s the law! Killing of birds in the wild in Maine is a Class E crime punishable by up to six months incarceration and a $1,000 fine. If you have any information on how this loon might have died please contact us. Click here for a photo of the loon – caution it’s a bit gruesome. How tragic, Watchic should become a sail, kayak, canoe, paddle board, and row boats only lake. Power boats & Jet skis should be banned from Watchic and this tragedy will never happen again! Where do our priorities truly lie? Lake health and wildlife would be so much safer when all power watercrafts are banned on Watchic! Unfortunately some people have no common sense. Watchic Lake really is not large enough for speed boats.